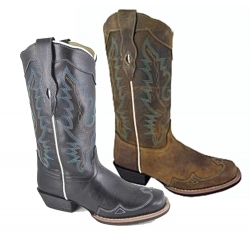 Smoky Mountain Ladies Augusta Boot, Rustic cowboy boot has a scalloped top, blue and yellow embroidered design, white piping on top and sides, filigree overlay on snip toe, western heel and rubber sole. For one of the best high quality, affordable boots try Smoky Mountain Boots. These fashionable women’s leather boots feature a man made lining, rubber sole, and square toe. Great for everyday wear, these boots are sure to become one of your favorites.